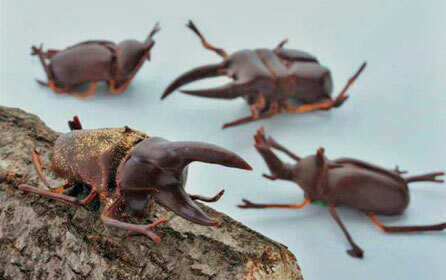 Namco’s Namja Land food amusement park will sell you some chocolate beetles for your Valentine sweetheart. 4,500 yen will get you a set of four: one Hercules beetle, one stag beetle, one male rhinocerous beetle, and one female rhinocerous beetle. Aww, that’s very sweet.